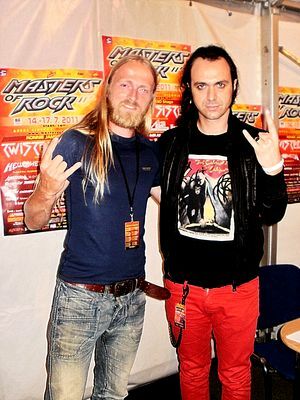 This year Masters of rock festival in Vizovice, Czech Republic, hosted also one of the biggest names from the goth – metal scene, Moonspell. It was a pleasure to speak with such a deep-thinking, well–read person that Fernando Ribeiro definitely is. At about 9pm the band still had some time before the show that was supposed to start at 1am, had an autograph signing session done and seemed enthusiastic about the crowd of at least 20 000 metal fans. When Fernando Ribeiro came to the press tent, everyone could notice one thing about him – charisma. After some interviews done, he seemed in a very good mood, answered every question to detail, 100% professional. Ladies and gentleman, please welcome in the world of Moonspell. Q: Tonight you are the main act, main act of the biggest metal festival in Czech Republic. How do you feel about that? A: I don’t know about that, I am quite confused myself. I think Hammerfall is headliner, because, you know, the name is bigger than Moonspell and also they have more time to play. But I tell you I am very glad that we are able to play such a large festival in Czech Republic in the way that we are the last band of the night. Even our last experience was Metalcamp, we played during the daylight and show was great. Night provides better atmosphere and intimacy for our music and songs. Last time we played here everything was fine and now I think even more people came to see the show, and you know, being here, meeting fans during autograph session, it’s great. Tonight we have a very special set. Q: Czech Republic seems to love Moonspell. Have you ever had a chance to be here longer? Q: We miss that in USA. A: Yeah, I mean… I’ve been in USA, it’s different, it’s a New World in a way and I like to play there. But in our music we are worshipping Europe. Even when European community is falling, we shouldn’t think we are less than USA. We are not a state, we are a country, and it is very important now. Q: The other question goes back to Moonspell’s past. A couple of years ago you released the album Memorial and it was like the band had a deep sip of fresh blood. What happened? A: Well, I don’t know. I mean, being a musician is something that doesn’t really have to have logic. I think it’s like those Gods in ancient mythology, they have a specific name and job and so do we. I believe that the band wants to express something. It’s not about agenda, label and our fans. Album like Memorial is an album we exactly wanted to do. Sometimes, when you are composing a new song, achievement is not perfect and sometimes is. In Moonspell we have our golden rule and that’s: not to listen to any other voices, only our inner voices when we compose and then we will see. The rest we can’t control. Someone likes it, someone cannot like it. With Memorial we made a statement like it was important for us but also for other bands (like Samael) and we are dead, but we were just lying in wait to jump to do a full metal album. Basically I’ve always believed that there was always space for quality music, for conceptual albums rather than what is pushed by magazines. Whatever label wants to put out on the market. I think Moonspell is one of the bands together with Katatonia, Opeth, a band that is very solid in their music and I think Memorial is for lots of people like a new beginning. Q: What about Label, weren’t they afraid that so much heavier material will be a business fail? A: No, I mean we’ve never failed in business. At the beginning, about us (being from Portugal) they were pleasantly surprised that we did 7 albums and all went well. When we finish mastering the album, we give it to them. What we give them is Moonspell and there is no one in the world that understands better what Moonspell is than them. So basically there was never problem with Memorial, nice turnover, very successful album in that time being and the band was very live. Q: What I believe, that now, Daemonarch could be released as Moonspell album. A: Everything you do has got its meaning and is important. I never wanted to be a musician in the first place; I wanted to be a teacher that was my dream and vocation. Then it changed, I left university to be able to go touring, doing shows, communicating with people. Daemonarch was an important step, communicating with our beastly side. It brought the band some darkness in the time we were doing more Goth albums. With music we started in Wolfheart, it was like going home. Q: Now I have some questions that are more personal, but not intimate. Q: Moonspell is quite a big name, can you live off music? A: Yeah, I mean, it all has to do something with your perspectives, you have to be aware that you are not going to be rich playing underground metal. Since 1996 I haven’t been doing anything else than Moonspell. We always found our way, more money or less money. Being musician is not like working in a band, your life goes up and down but what’s safe in the world right now? I quit studying philosophy to become a musician. Many students from my year work as supermarket cashier, intelligent and talented people. So I think that with a bit of luck and talent, I have to be thankful living off and living for music. Q: About your future, do you think music can fit in your family life? A: Yes, my wife is a musician, a singer, so we understand each other. We have never had a problem about that. Life is what it is. What’s worse: being on tour and not seeing kids or working 9-5 job and not seeing your kids as well, even you are at home? Nothing is perfect. You have to explore what you do and my family life is great and will be great even though I live as a member of Moonspell. Q: The time of your show is coming, I’ve got 2 more questions. In eastern and southern Europe, in Romania too, there are thousands of Moonspell fans who can’t afford to buy original albums, they download them… Do you consider them as your valuable fans? A: Of course I do. I was young and I also couldn’t afford original albums and put it on tape, so it’s basically the same. I think it’s important to buy an album when you have a chance. Label, I made an effort, our albums are available throughout the Russian Federation for 5 dollars. We don’t want to discriminate our fans. Buying on albums is not giving free money to the band; it’s a piece of art. The band carries this art in their life and it helps in producing art. There should be a balance. If you don’t buy an album, come to a show, buy a T-shirt. Musicians have always been living in crisis, it’s not our war, it is label and people for us are important to go on. Q: My last question is: have you ever had a tour or memories from the past that can be compared to what is described in Motley Crue books? A: There is more similarity in us and what is described in Celtic Frost memories. I relate more to that you know… being European band from Portugal. I read Dirt from Motley Crue. We started touring as a pack of hungry wolves, going throughout Europe, having everything, you know…some things happened, nobody is a saint. We did little bit of everything, but through our career we focused on music and our shows. We have never been dependent on anything – drugs, women, etc. When you are… you are completely missing the point. Those things happen, they are side effects of musician’s life but they distract you from what’s important – music. We are from Portugal. Europe. We are glad to be playing in Czech Republic. We had to travel more than anyone else; we focus on playing our best as a last band of the day. Thank you very much for the interview. Have a great show and audience. Moonspell started their show exactly at 1am as planned and had a difficult task to wake up the tired audience. But once they entered the stage, full of energy, they had a crowd following them. Very special set consisted of whole Wolfheart album and hits of Irreligious. A bit slower set than they usually played recently, but it fitted very well into the night and it was a night of a full moon that was watching us all from the sky. Excellent show that could be described only as FULL MOON MADNESS!! !